HP 7 VoiceTab is the company’s latest tablet launched in the VoiceTab series in India for Rs. 10,990. It seems the company is making maximum efforts to remain in the present hot competition of Smartphones and tablets with launch of new devices. The device features a 6.95-inch display and runs on Android 4.4 KitKat out of the box. In addition Lenovo also launched Android KitKat tablet, the Lenovo A8-50 with voice calling features in India for INR 17,490. 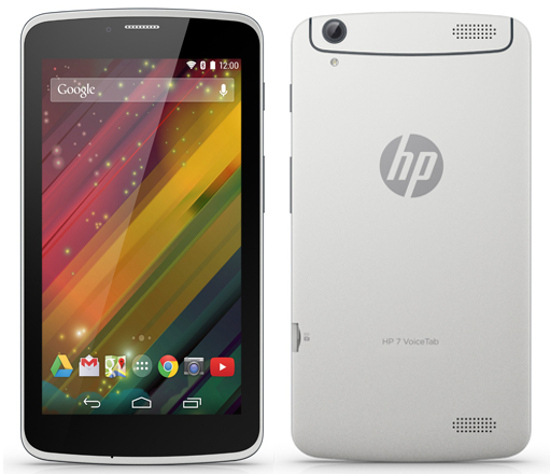 So let’s check the detailed specification and features overview of HP 7 VoiceTab Android tablet. The HP 7 VoiceTab sports a 6.95-inch capacitive multi touch display and has 1024 x 600 pixels screen resolutions. It is powered with 1.3 GHz quad-core MediaTek MT8382 processor coupled with 500MHz Mali 400 MP2 GPU and 1GB RAM. The tablet has 8GB of internal storage which can be further expandable with microSD card. The HP 7 VoiceTab has thickness of 10.15mm and weighs 305 grams and packs with 3000 mAh battery on the back. The HP 7 VoiceTab tablet features a 5 MP primary camera with LED Flash and there is secondary camera of 0.3 MP (VGA) for video calling features. Having 3G connectivity on top, it also adds other options like WiFi 802.11 b/g/n, Bluetooth 4.0, GPS and USB OTG. Like all the new entry level devices, it also runs on Android 4.4 KitKat out of the box. The HP 7 VoiceTab android tablet comes in White color and is priced at Rs. 10,990. The device can be purchased from the official HP Online Store and other retailer’s outlets across India.